Photo by Amy PenningtonHannah, Hawk, Link and Paul Catlett and their dog, Butters, enjoy spending time outside. While living in a loft in downtown Springfield, Paul and Hannah Catlett started searching for land on which to build a home and raise their future children. “We wanted to give our future family a rural experience,” Paul says. But Paul’s dream was to own a farm or a ranch, which didn’t quite line up with Hannah’s ideal home. “He wanted a farmhouse, but I preferred more modern architecture,” Hannah says. 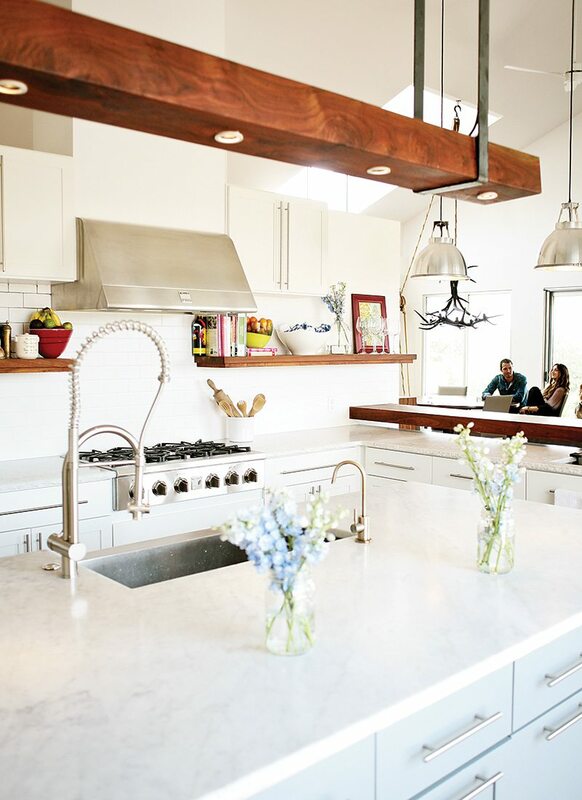 The two worked with architect Matthew Hufft of Hufft Projects and builder Kenson Goff of Kenson Goff Homes to meet in the middle, designing and building their 6,000-square-foot modern farmhouse. The first and very crucial step in building this home was finding the land, and the Catletts found the perfect 3-acre plot just east of Springfield. “We bought the property and had the Amish dismantle the house on it, letting them keep the wood,” Paul says. 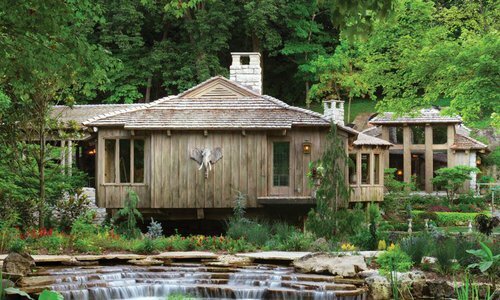 They rebuilt a barn complete with a 400-square-foot apartment, which is where they lived when they constructed their home. Paul and Hannah worked with Hufft to make the home light and bright with lots of windows. “I wanted to feel like even when I’m inside, I’m outside,” Paul says. 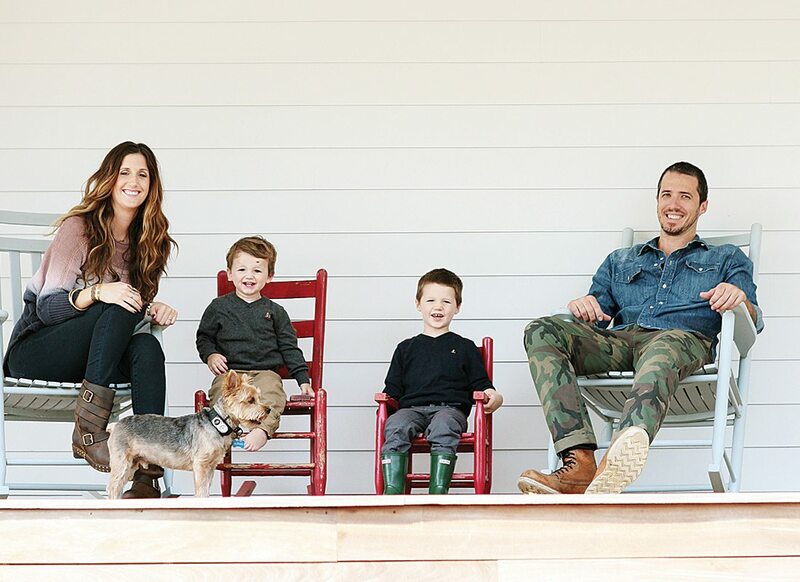 “We experience everything—rain, snow, lightning.” And the family (which includes Hannah and Paul and their two boys, 3-year-old Link and 2-year-old Hawk) actually does spend most of its time outdoors, often on the porch. “The porch wraps around three-fourths of the house,” Paul says. In fact, it was named the Porch House by Hufft. 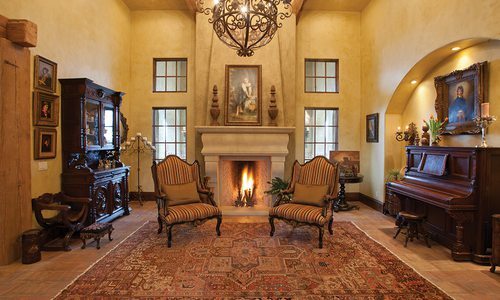 The Catlett home offers breathtaking views of the James River valley. And the inside of the home is equally aesthetic with a distinct modern interior design, created by Paul. “When you design, you can design to fit your needs and your lifestyle,” he says. And for the Catletts, this includes many environmentally friendly features, such as the use of natural light, geothermal heating, reclaimed wood, low-flow water faucets and Energy Star-compliant appliances, to name a few. Products used in the construction of the home were designed to make a world of difference in utility bills and sustainability, with most of the items on the exterior slated to last nearly 100 years. Photos by Amy Pennington (Right) Paul and Hannah Catlett’s home sits on a high point and offers an expansive view of the surrounding James River Valley. 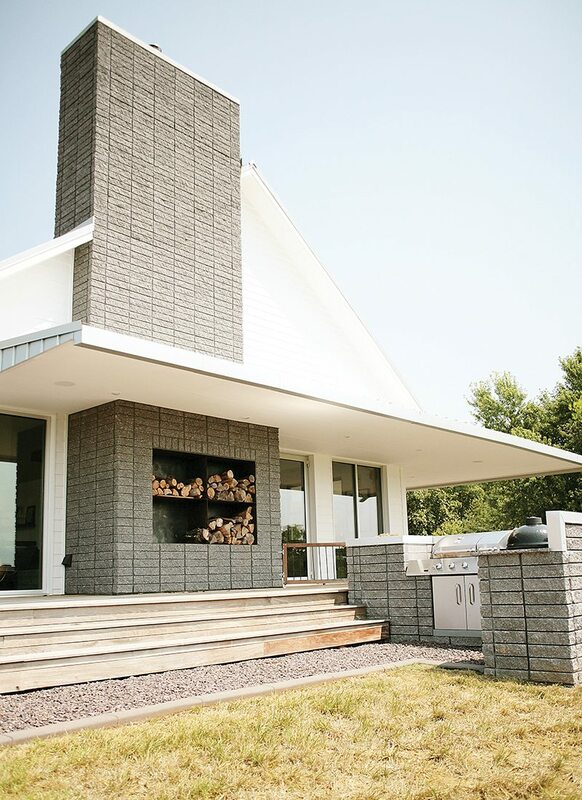 It’s adorned with concrete siding, commercial-grade windows and doors, a stainless-steel roof and a Brazilian-hardwood porch. All of the items are expected to last nearly 100 years. (Left) Paul has been collecting rugs since he was 18. 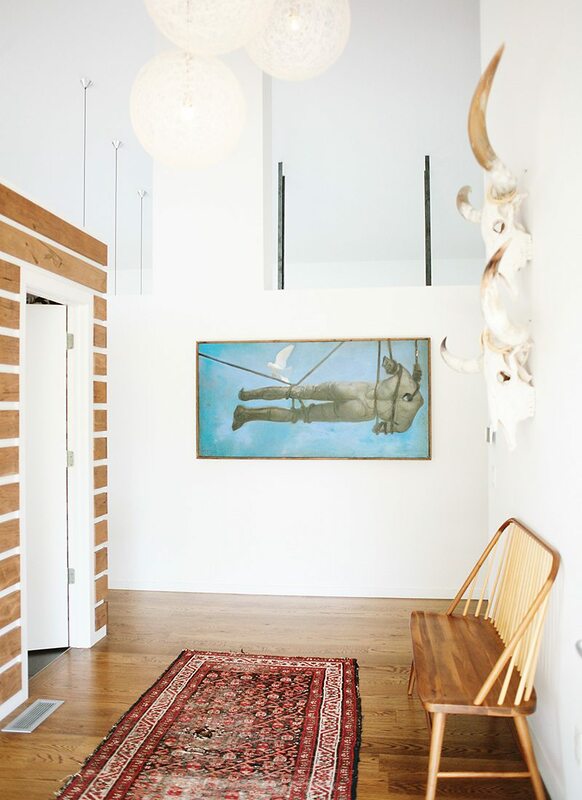 You can find many of them displayed on the home’s reclaimed wood floors, including in the entry (opposite). 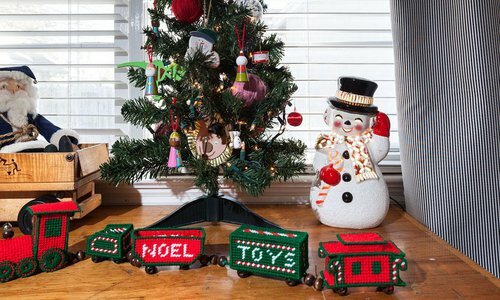 “Most are really old, even from the early 1800s,” he says. 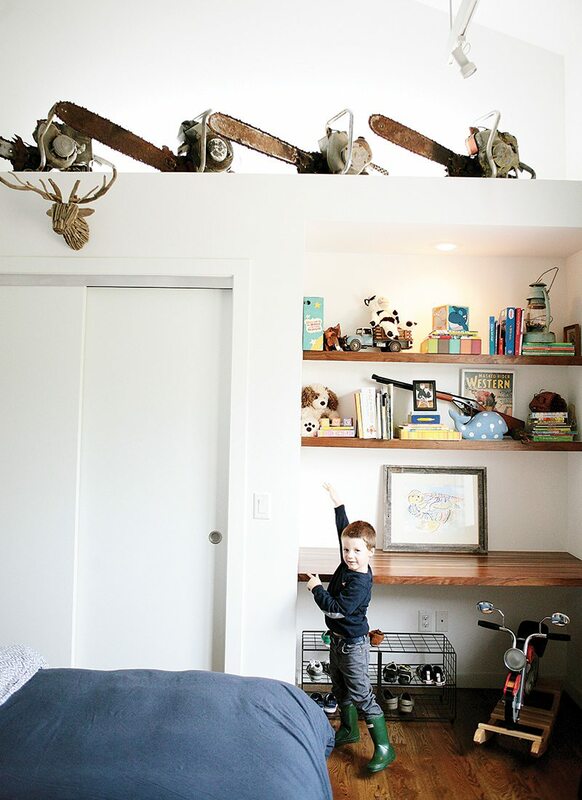 A walnut cube powder room sits off the area, which greets visitors with vaulted ceilings and a fun painting. 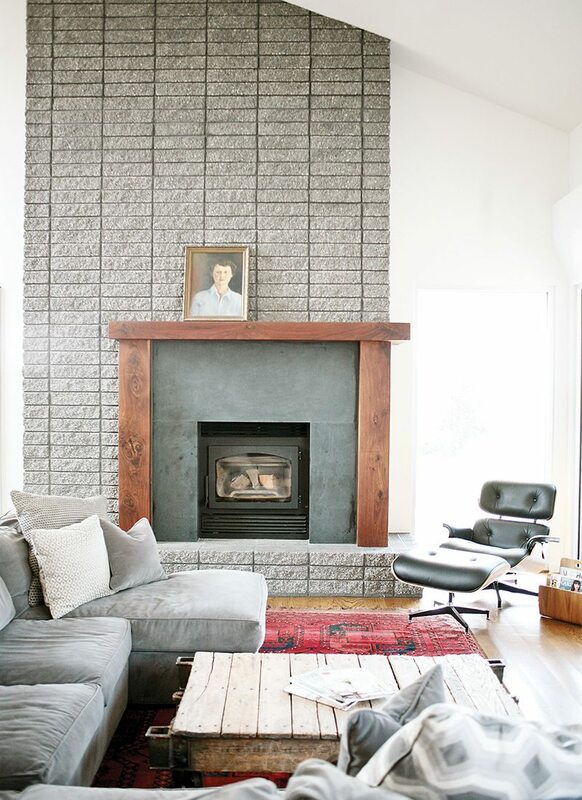 Photos by Amy Pennington (Left) Modern cinder blocks make up the living room fireplace, which is dressed with a painting of Hannah’s grandmother. 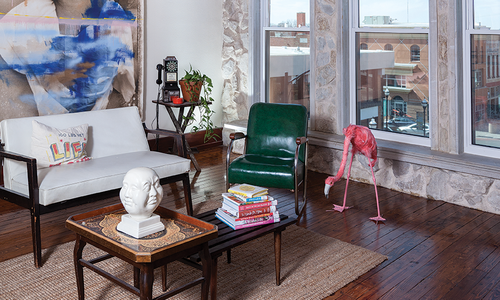 Wood in the home came from a farm in Niangua, and the floors were milled in Brighton. 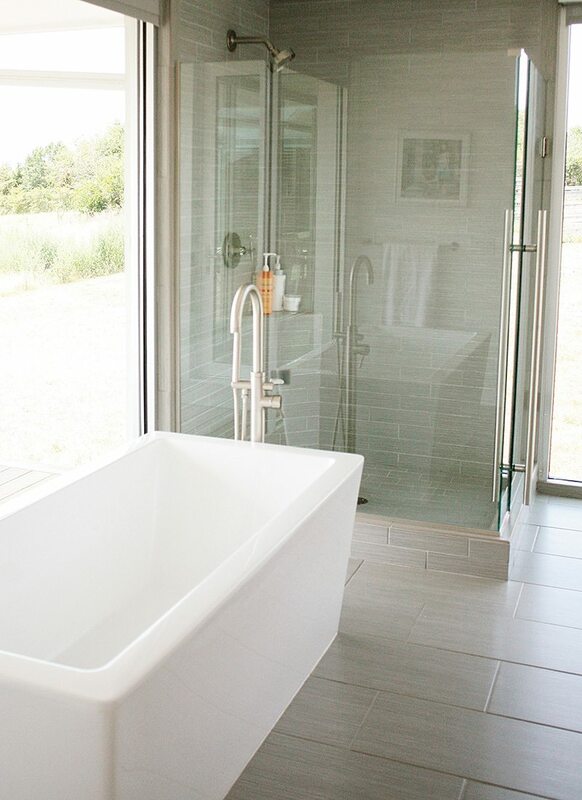 (Right) The home’s master bathroom is separated from the bedroom by a sliding barn door, and it offers a great view of the James River valley. Photos by Amy Pennington (Left) There’s a long hallway that leads to the master bedroom (right). “We designed it that way because we wanted our master bedroom to be like our little vacation spot or our own little getaway,” Paul says. 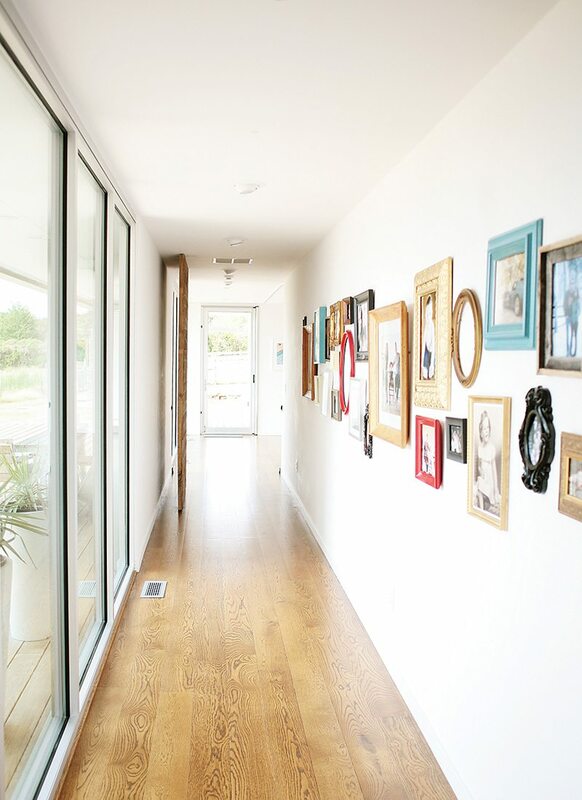 The hallway is dressed with various framed pictures that include the Catletts and their extended family. “We change them every couple of years,” Paul says. “It tells the story of lineage of when I was little.” (Right) The kitchen is where the family spends much of their time. “This is the foundation of our family,” Hannah says. It’s also where the couple entertains guests several nights a week. The light fixture was custom-made by Paul from a piece of walnut, and the room features wood shelving and honed Carrera marble countertops.